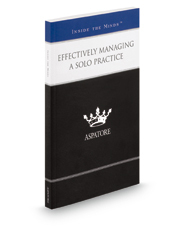 Effectively Managing a Solo Practice provides an authoritative, insider's perspective on best practices for establishing and maintaining a law office with a single partner. Experienced solo attorneys from across the nation guide you through crucial topics, such as consulting with other attorneys on complex cases; working with associates and paralegal staff; and attracting clients through advertising and word of mouth. Covering a range of topics from handling insurance, office space, and other operating expenses to evaluating marketing strategies to fit a specific practice, these knowledgeable lawyers share their insights on the business side of running a single-partner firm. Additionally, these experts discuss the importance of specialization and advise readers on how to determine what areas of practice work best for them as independent lawyers. The different niches represented and the breadth of perspectives presented enable readers to get inside some of the great legal minds of today, as these top attorneys provide key insights on this rapidly-growing style of law practice.